Use the Digital Radiation Monitor to monitor alpha, beta, and gamma radiation for explorations in radiation statistics, measuring the rate of nuclear decay, and monitoring radon progeny. The Digital Radiation Monitor consists of a Geiger-Mueller tube and a digital rate meter mounted in a small, rugged, plastic case. The unit is battery operated and can be used with or without an interface for measurement of alpha, beta, and gamma radiation. When used with an interface such as LabQuest, it can be used to study counting statistics, inverse-square relations, shielding effects, and other quantitative experiments. Without an interface, use the built-in counter and timer to measure count rates. Sensor LND 712 (or equivalent) halogen-quenched GM tube with a mica end window, 1.5 to 2.0 mg/cm² thick. Rated at 1000 counts per minute using a Cesium-137 laboratory standard. Power One 9-volt alkaline battery provides a battery life of 2000 hours at normal background radiation levels. What's Lurking In Your Countertops? 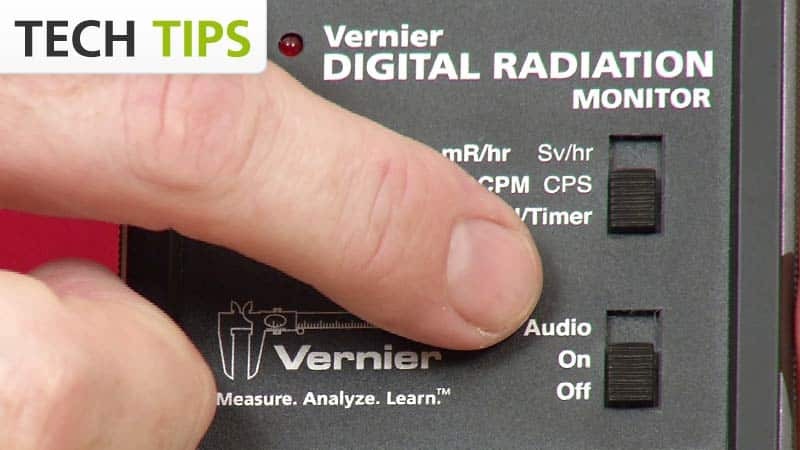 The Digital Radiation Monitor may require a compatible interface and software. Choose a platform below to see compatible interface and software options. The Digital Radiation Monitor is fully supported with LabQuest 2 (version 2.8.5), a standalone data logger with built-in graphing and analysis software.